Melody Gilbert is an award-winning independent documentary filmmaker who has directed and produced non-judgmental, character-driven stories for film and television for more than 20 years. The Documentary Channel calls her "one of the most fearless filmmakers in contemporary documentary cinema." She has made five independent feature-length documentaries in the past seven years: FRITZ: THE WALTER MONDALE STORY (2008), URBAN EXPLORERS: INTO THE DARKNESS (2007), A LIFE WITHOUT PAIN (2005), WHOLE (2003) and MARRIED AT THE MALL (2002). All of her films have screened at major film festivals, in theaters and on television worldwide, including the Sundance Channel and on dozens of television networks internationally such as TF5 (France), YLE (Finland), RTL (Germany) and more. Melody produces, directs, and shoots (and sometimes edits) all of her films. 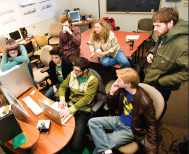 As an executive producer and professor at Carleton College, she worked with film students to create the documentary DISCONNECTED in 2008 (click here to access the DISCONNECTED website). In 1996, Ms. Gilbert started teaching broadcast journalism and documentary production at the University of Minnesota's School of Journalism and continues to teach students how to make documentaries when she is not making her own. She has taught at Carleton College, IFP, College of Visual Melody teaching a high school workshop about documentary filmmaking Arts, Walker Art Center and in Romania and Kyrgyzstan. In 2001, she formed her own company, Frozen Feet Films, and has been an independent director/producer since and continues to teach as the opportunities arise. Everything I Know About Documentary Filmmaking... in 30 minutes or less! All of her presentations include clips from her films and audience participation. Click the button below for a complete list of classes. As an independent documentary filmmaker who works mostly solo, I am driven to explore the unknown, the unconventional and the unexplained. With my video camera and microphone in hand, I immerse myself into the lives and subcultures of the people in my films. I make an emotional commitment and an ethical promise to tell these stories in an intimate, respectful manner and I never, ever exploit or sensationalize.